Will Make Beats For Food : Apt. 5B Podcast Hosted by Kil: When Did Black Folk Stop Rocking With Justin Timberlake?!?!? Apt. 5B Podcast Hosted by Kil: When Did Black Folk Stop Rocking With Justin Timberlake?!?!? For this week's ep of my podcast Apt. 5B I'm chopping it up with JR and Sin about when did black folk stop rocking with Justin Timberlake? Was it after the Janet Super Bowl debacle or when he dissed Prince? It couldn't have been cause that was back in '04 and in in '07 and I KNOW black folk were rocking with Just through those 20/20 albums so that can't be it right? Was it after his BET Award tweet to Jesse Williams saying he was "inspired?" I don't know why black folk would stop rocking with someone after saying they were inspired by Williams but I like this album so what the hell do I know? Was it after he wore a #TimesUp pin to the Golden Globes but is still in a Woody Allen film? It can't be that cause black folk don't even watch Woody Allen Films, so I honestly don't know when & why we stopped messing with JT. Or could it possibly be that black folk just don't wanna hear about no blue eyed soul during this black lives matter days and times when all of us need to be "woke"? 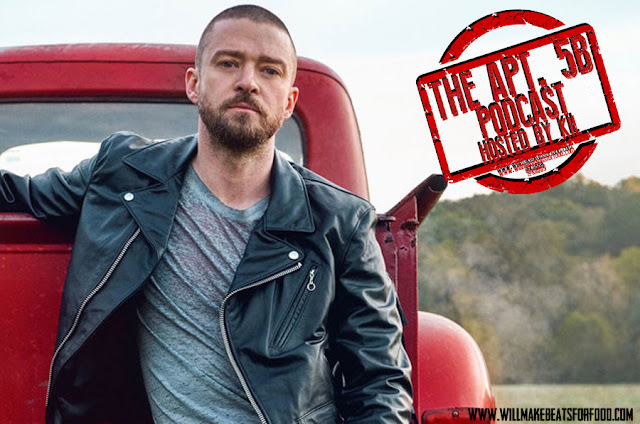 Welp, no matter what the real answer is you can rest assured after this ep, JR & Sin break down a couple of reasons why they think JT isn't invited to the BBQ anymore and why neither one of them is felling "Man of the Woods." Just ANOTHER dope ep ya'll and don't forget to subscribe to our You Tube page and out Mixcloud page!